This is, I think, the best episode in the second half of Sagan's "Cosmos" series. Apart from one later cartoony section, the visuals and music are particularly exceptional here. The subject matter is also fascinating all the way through and fairly solid. The first 1/3 of the episode is centered in and around Cambridge university, where atomic structure was first discovered. Sagan gives quite a complete explanation of atoms here, from size and scale, to their composition from the building blocks of protons, neutrons, and electrons, and the various forces that need to be rebalanced to put things together. These sequences are kept lively by creative use of the location and many different props. Quite good. 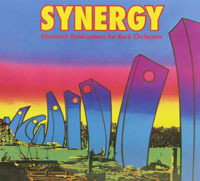 Since this sequence is primarily concerned with all you need to know for the later stellar phenomena sequences, it doesn't quite go far enough to cover topics like ions (basically atoms that do NOT have the right number of electrons to be electrically balanced), or the concept of building molecules out of atoms, which could get us into valences and completing various electron orbit shells. Perhaps that should ideally be in a different episode if done at all though, because the atomic section that we do get is a hefty chunk in itself, after which the episode makes a stylistic and visual shift, and enjoys a burst of new energy as it tackles some different ideas altogether. The episode makes a successful return to outer space and the depths of time for its next segment. We begin with a review of what we know about the composition of our own sun, and the processes at work there. This is a visually beautiful stretch of the program. Modern presentations of the show feature some excellent full motion CGI, which is mixed with actual scientific photography and film of our own sun's churning gases and corona, ejecting plumes of material into space. Sagan then describes the details of the changes the sun will undergo in its lifetime, and contrasts this with other types of stars. This he does very nicely and succinctly, such that viewers are prompted to come out of this episode with a very clear idea of what many celestial objects are, and what it is that makes them different or special. But the most definitive sequence of the episode comes next, as Sagan takes us in the familiar Ship of the Imagination to witness a supernova explosion. It's about the only time in the series that we get a bit of high tension and drama in the ship, which helps the sequence stand out a bit. Some of the graphics don't seem very modern, but they have a unique bit of charm to them. How well-built is Sagan's ship? How many of these forces can it withstand? The sequence wraps up by connecting the dots appreciably. It is thanks to prior Supernova explosions that we get to enjoy all the heavier atomic elements that these big powerful stars fused and synthesized in their interiors. Another most memorable bit is the portrayal of the timespan of Human observations of the Crab Nebula - ancient cultures recording what was likely a supernova explosion in that location, while modern astronomers regard the nebula as the gaseous outer shell of that supernova, and the rapidly spinning pulsar in the center as the supernova's core remains. The details of what a pulsar is kick off the episode's final segment of wilder ideas of various space phenomena that may be out there, and the wilder branch of physics that may support those types of objects. There's quite a large variety of things here, such that new things continue to pop out on subsequent viewings. Before it's all over, Sagan gets quite poetic and excited about it all, and the episode comes to a grand, exciting, and once more visually exquisite conclusion. In terms of having any content I might have a disagreement with, the episode is also fairly pure. There are a few hints at limiting evolutionary possibilities, but these are quite faint ghosts of material already tackled head-on in episode 2. There's also a tiny bit about Einstein's theories to support the concept of black holes. I don't know if any aspect of this might one day seem dated, but black holes currently still work for me, and Sagan does present them in a milieu of fascinating speculative ideas. But, you've gotta love the supernova sequences, the pulsars, the discussion of the Crab Nebula as it was observed down through history, and the sequence of wrapping Cambridge up in a Googolplex as though it was a sophomore prank. Yes, episode 9 here is one of the better ones, and a good highlight to look forward to during the later parts of the run. 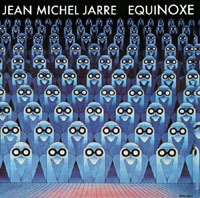 Compositions that were unique to the original 1980 version are typically shaded blue-grey. 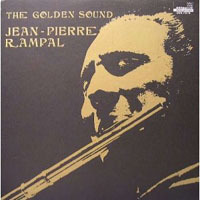 Compositions that remained the same for both versions are stretched out across both sets of columns, even though Cosmos doesn't necessarily use the same recording or excerpts of that composition. Exact sync cannot be expected in these cases either, as the new version features a completely new re-dub of all music. And as before, anything written in green text represents a name I made up to help keep some music better identified in my own head. "King of Pies" What's this? exact recording here. Pie is served. ?? Vangelis? 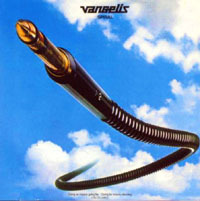 "Ghost of the Sun"
section 2 of 7: "Augurs of Spring"
The last minute of the title track "Spiral" appeared in "Cosmos", even though little of its distinctive opening was heard at that point, making it one of the more unrecognizable uses of Vangelis music. 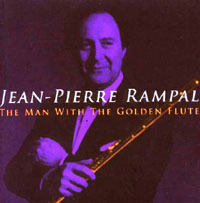 go-to album for flute pieces when music was first tracked onto Cosmos. Not only is the first piece here in episode 9, but cue sheets indicate that every other composition made an appearance somewhere in the original 1980 version.... 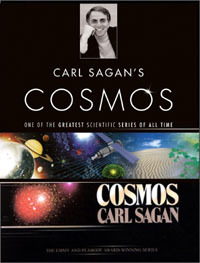 However, many of the changes to Cosmos music were due to copyright issues, and ALL cues from this record were replaced in the 2000 Collectors' Edition on DVD and Blu-ray. It also seems that whoever first compiled the cue sheet for episode nine mistakenly copied the information from side B's first track, when side A's first track was actually used on the program. 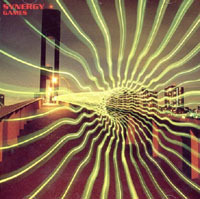 This album available on CD. This album available on vinyl. In all honesty, I hesitate to promote the listed title of the first track, since the music seems to have no connection with the key of B natural minor, and is not among the 12 sonatas in Marcello's Opus 2 published in Venice in 1712. I'm still keen to match this tune to some sheet music, or hear another recording of it, to see what other title(s) it might be going by. (1) Adagio, (2) Allegro, (3) Largo, and (4) Allegro. It has ONE FLUTE leading with a melody, while the harpsichord plays bassline accompaniment. This album available on CD, mp3 download, or streaming. Tracks A1, A2 & B1 recorded in München (Munich) 1966 Nov.
Track B2 recorded in München 1959 Oct. 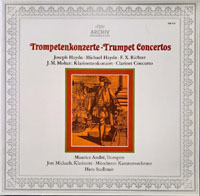 Early in episode 9, Cosmos uses the trumpet cadenza from the end of Joseph Haydn's Concerto in E flat movement 1. 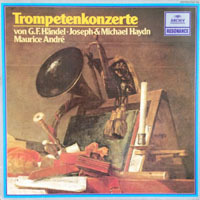 Since the solo player performing such a cadenza will improvise to create his or her own unique virtuoso performance of the piece, only Maurice André's 1966 recording here will match what you hear in Cosmos note-for-note. So, this is THE recording that Cosmos fans will truly want. This documentary has become available on DVD. 13 hour-long episodes, 1980 U.S.
Read the data capsule review for the next episode: "The Edge of Forever"